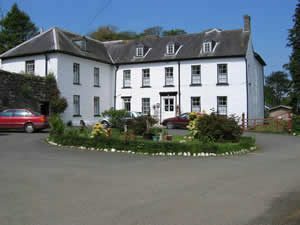 Priskilly is home to the Evans family who have welcomed guest to their bed and breakfast from far corners of the globe to Priskilly Forest, Pembrokeshire for over 50 years. There was a dwelling at Priskilly Forest in 1326 although its character today comes from the Georgian era with beautifully proportioned big rooms, original coving, ornate fireplaces and tall ceilings, all contributing to its architectural hallmarks. Set in some 400 acres, Priskilly Forest is surrounded by rolling farmland, an ancient forest with Bluebell woodland walk and attractive golf course. Set up with rhododendrons, oaks and an abundance of mature fauna and flora. 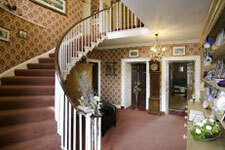 The Bed and breakfast offers a restful holiday, golfing break or welcome stop en route to Ireland all in 5 star quality. Spacious and en-suite with either golf or garden views. Tastefully decorated in keeping with original features. 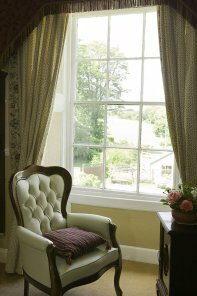 Enjoy Afternoon or High Tea served with homemade good quality Pembrokeshire Produce followed by a relaxing evening by the log fire in the drawing room. Bespoke packages for business, pleasure or golf can be arranged.